In the beginning, Terry Forster must have seemed like The Natural. He made it to the major leagues as a teenager able to do anything and everything on a baseball diamond. In his first two big league seasons, he averaged better than a strikeout per inning on the mound and went 12 for 24 at the plate. His all-around abilities extended to the basepaths, too, as in 1972 he became the last American League pitcher to steal a base before the institution of interleague play. The designated hitter rule in 1973 took the bat out of Forster’s hands for the next few years, but in 1977 he moved to the National League and racked up 9 hits (including a double and a triple) in 26 at-bats for a .346 average. Because of the role he settled into for the rest of his career—short reliever—he would never again get more than 8 at-bats in a season, but he continued to produce with the bat whenever called upon, and his lifetime batting average reads like a typographical error. Terry Forster was a .397 career hitter. As you may or may not have noticed, I decided that to continue posting team predictions deep into April was pretty dumb, plus the team predictions I’d been posting had become increasingly allusive to the point of not really being predictions at all. 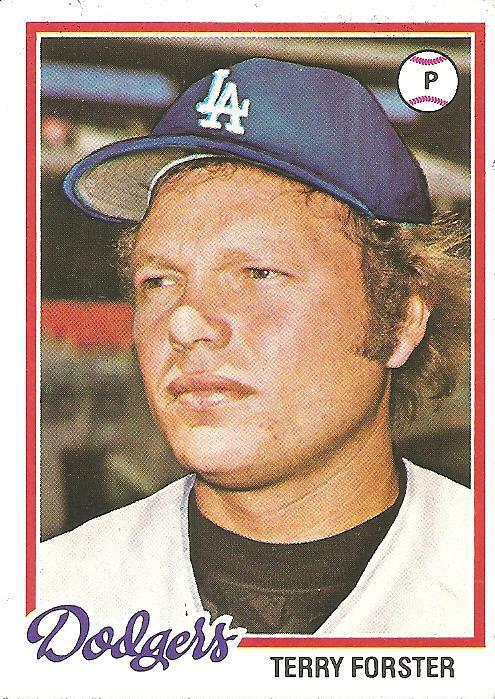 Still, I’m going to finish out the last few cards in my stack of “team prediction” cards, and if anyone wants to attempt to connect this 1978 Terry Forster card to the fortunes of the 2011 Dodgers (or the Jose Canseco card from Monday to the 2011 Blue Jays, etc. ), I am all ears. I did want to make sure and direct anyone wishing to enjoy the 2011 baseball season from a Dodger perspective to Dodger Thoughts, a shining light in the baseball blogosphere and one of the great online communities of any stripe. Finally, a question, in honor of Terry Forster: Who would make up the all-time “goo” team? The pitching staff would be easy to assemble, and I’m sure there’ve been some portly catchers, outfielders, and corner infielders, but I’m drawing a blank for the middle infield spots. If you’ve got any suggestions to fill out the roster below, please let them fly. You are currently browsing the archives for the Terry Forster category.